Gold market participants saw a $56 trading range yesterday, with lows of $1,716.5 and highs of $1,772.5. By the end of the session, the precious metal had closed at $1,767.0, after gaining $36.2 on fears of higher inflation further down the line. This morning, the gold financial spread trading market is currently trading at a six month high, extending yesterday's 2% gain. The November Brent crude oil futures market rose by $0.37 yesterday, to the end the session at $115.59 a barrel, its highest level since 3 May. This came amid concerns that the recent attacks on the US consulates in Egypt, Libya and Yemen could lead to a return of violence in the region and thus affect production. Even though the gold market initially reached $1,747.17 yesterday, the precious metal actually closed pretty flat at just $1,730.80. This came as investors felt reluctant to commit too much ahead of the FOMC meeting. Considering the expectations for QE3, as well as comments made by Bernanke at the Jackson Hole summit, any disappointment could be followed by a quick sell off. Despite social unrest in Libya, Nymex crude oil only finished marginally higher, rising $0.16 to settle at $97.01. The same limited impact was observed in the release of the weekly US inventories report, which showed a gain of 2 million barrels, against estimates for a 1.8 million loss. The two pieces of news may well have cancelled each other out, especially because of the already cautious approach from energy investors ahead of today's Fed meeting. Gold is not only perceived to be a hedge against inflation, but also a good buy in times of trouble and uncertainty. Prior to crucial decisions on both sides of the Atlantic, the precious metal gained $5.5 yesterday, closing at $1,731 and remaining close to the recent highs. In addition, a lower US dollar definitely helped, as the two have an inverse correlation. Despite conceding a downside risk for the global economy, OPEC maintained its oil demand outlook for the current year. This supported yesterday's rally in price of WTI crude oil, which saw a gain of $0.88 to close at $97.17. At the same time, the energy sector looks set to stay ahead of the game by continuing to price in QE3. If the Fed does press the button, this should also bring higher demand for oil. After rallying sharply from mid-August to Friday's recent high of $1,742, the gold market stopped for a breather yesterday. Investors are trying to assess the likelihood of QE3 being mentioned during this Thursday's FOMC meeting. The loss of $11 to $1,724.60 was probably more down to profit taking than anything else, so it could prove dangerous to read too much into it for now. Initially, WTI crude prices moved lower on signs that oil demand in China, the world's second biggest economy, is plunging. However, despite a stronger dollar and a dip in the stock markets, crude oil finished the session $0.30 higher at $96.54. It seems that energy investors still believe that the Federal Reserve will add stimulus measures to help a stuttering US economy, and so support demand for crude oil. Having seen a steep retracement during the early hours on Friday, the Non-Farms data saw gold reverse course and end the day some $34 higher at $1,735.40. Investors moved into safe haven assets, as the perceived likelihood of monetary intervention suggested a potential devaluation of the US dollar. Ironically, despite the disappointment over the US employment report, Nymex crude oil futures gained $1.70 to close at $96.42 a barrel. Energy investors mirrored the global markets, and interpreted the numbers as a sign that will push the Fed towards QE3. However, there was also some speculation about the release of emergency oil reserves, which should restrict any significant price increases. After all, the US will be having elections in two months time. Yesterday, commodity investors decided that, by boosting its balance sheet, the European Central Bank will raise the prospect of inflation down the line. The result was a rush into the gold spread trading market, pushing the precious metal above the $1,700 mark to an intraday high of $1,713. Even with a retracement towards the close, the price of gold still posted a daily gain of over $7, settling at $1,700.90. US crude oil was initially lifted by the announcement of the ECB's bond buying program, as well as signs that the US economic recovery is staying on course. However, the larger-than-expected fall in crude stockpiles was rather discarded by falling oil imports, which came on fears of disruptions in refinery activity following Hurricane Isaac. Consequently, the price of US crude gave back the early gains, even finishing $0.47 in the red at $95.53. The gold spread trading market fell by $1.85 yesterday, dropping to $1,693 after media speculation that inflation would remain largely unchanged by the planned bond buying in Europe. The precious metal is perceived as a good hedge against the fear of inflation and so tends to go up when paper currency has the potential to be devalued. This morning, the $1,700 mark was so close that it has already tempted buyers. At the time of writing, they have pushed gold to a new recent high of $1,705. Uncertainty in the global markets kept energy investors nervous yesterday, and so they avoided making any fresh commitments, apparently happy to play the waiting game. Moreover, the weekly crude oil inventories report will be released a day later due to the Labor Day holiday. So it was no surprise to see the price of WTI crude oil closing just $0.25 down at $95.36. Gold investors have interpreted the gloomy manufacturing data as strengthening the case for another stimulus package, and so they pushed the precious metal higher. However, the gain of only $2.90, to $1,695.00, could also suggest a cautious approach ahead of the crucially important events due to take place in Europe and the US. The bulls will now be hoping for a break and hold above the $1,700.00 mark. Despite the lingering high rate of unemployment, the price of US crude oil has risen in the last few months on hopes of QE3 and signs that the US economy is improving. The latter was placed under question yesterday, with manufacturing numbers disappointed for the third month in a row. As a result, energy investors rushed to the exit, with US crude prices plunging $1.84 to $95.30. In commodities spread trading, gold prices took a breather yesterday, ending nearly flat at $1,691.30, as the US Labor Day holiday kept spread trading investors on the sidelines. It's worth mentioning, however, that the precious metal did reach a recent intraday high of $1,695.40, last seen on 27 March this year. It remains to be seen whether the current speculation about another round of stimulus will come true and push gold further up. Amid low trading volumes, the price of WTI crude oil advanced $0.49 cents to $96.87, driven by a slight weakening in the US dollar. The market price remains close to the recent highs on signs that the US economy is recovering, albeit at a slow pace, as well as ongoing hopes that 'if needed' more quantitative easing could be on its way. We saw a sharp rise in gold prices on Friday, as Ben Bernanke seemed unhappy with the current unemployment level and suggested that he was prepared to take measures to address that. 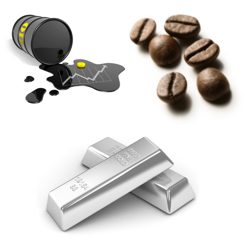 Despite the lack of details, or even a clear mention of QE3, commodity investors started buying aggressively, pushing the precious metal up by $36.10 to a new recent high of $1,691.40. In leaving the door open for additional stimulus, Bernanke helped the energy sector, with Nymex crude oil futures rising by $1.72 to $96.47. A better-than-expected reading for the University of Michigan Consumer Sentiment survey indicated that the economic data is still fairly strong, which should support the demand for oil. Last, but not least, a weaker US dollar and a rebounding stock market helped to accentuate the rally.